I don’t usually marinate my steaks. It just kinda depends on how I feel that day. Today, I wanted to turn a pretty standard steak into something completely not standard. This molasses chili steak marinade definitely did that. You get some sweet, but it’s not overwhelming at all. Not in the least. You get that great southwestern chili flavor. And hints of soy and rice vinegar. And best of all, you can still taste the steak. That’s why I bought one, ya know? I still want to taste meat, but I don’t mind making it a bit different. Because of the molasses and brown sugar you have to keep the time the steak spends over direct heat to a minimum. That high heat will definitely give you a char quick. Just sear it off and then move it to indirect heat to finish cooking. Just before you cook up your steak, make a batch of my jalapeno and onion steak topping and keep it warm until you’re ready to slice into that tasty meat. If you’re feeling in the mood for spicy, substitute hot chili powder, a little or a lot. Also try my Asian steak marinade. For the perfect meat-and-potatoes meal side dish, make my roasted spiral potatoes. Whisk together all ingredients except for the steaks. Pour marinade into the bottom of a large resealable container, or divided between two containers large enough to hold each steak. Add steaks. Coat bottoms well then flip and coat other sides. Cover and refrigerate for 1 hour, flipping the steaks every 15 minutes. Cook as you normally would. Note that since the marinade contains molasses and brown sugar the steaks will char if left over high heat for very long. Sear your steaks over high heat then finish them over indirect heat to prevent burning. Hoosier Momma’s Bloody Mary mix is mighty, mighty tasty. The spicy version is nice and spicy, just like we like it. Anita loves the mix in Bloody Marys. Me? I use it in cooking. That great spicy flavor really jazzes up any dish you use it in. This is about the easiest way to add bold flavors to a steak. Just add some (or a lot) of Hoosier Momma’s Bloody Mary mix to any steak. Let it sit in the fridge for a few hours. Then, shake off all the excess marinade and toss it on the grill! 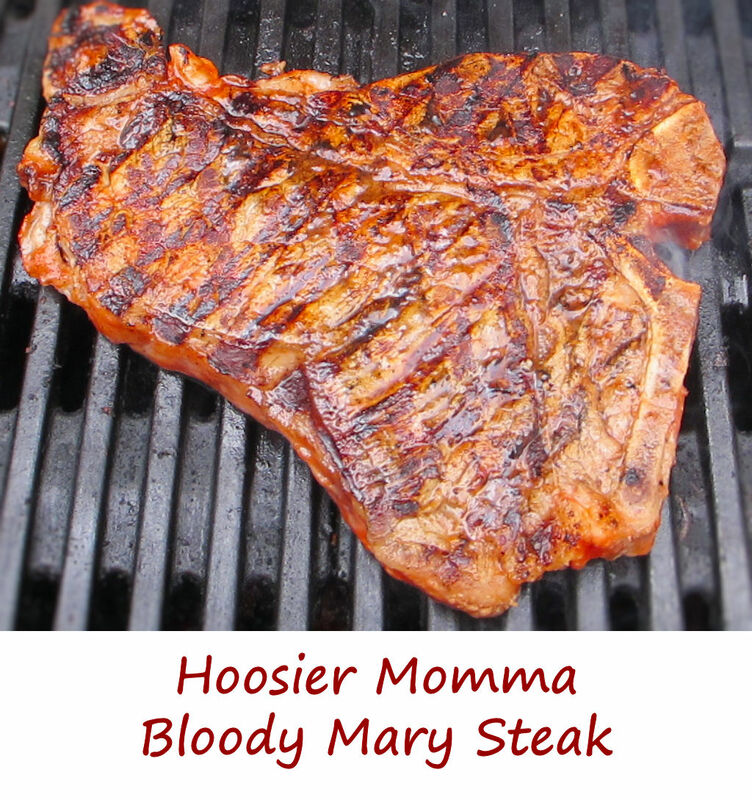 You can see the beautiful color of the Hoosier Momma Bloody Mary steak! Yummy! Hoosier Momma also has a Sriracha-flavored Bloody Mary mix. If you love Sriracha (like we do) use it instead for even more heat! Also try my adobo ribeye steak with fried poblano strips. For more great Bloody Mary flavors, try my Bloody Mary wings. Place steak in a resealable container. Add enough Bloody Mary mix to cover the steak. Flip the steak over and add more mix so that both sides are covered in yummy Bloody Mary mix. Seal and refrigerate for at least 1 hour before cooking. Fire up your grill for however you like to cook your steak. I cooked this one entirely over direct heat, but sometimes I sear my steaks over direct heat then move them to indirect heat to finish them. Remove steak from the marinade and shake off (or gently scrape off with a knife) any excess marinade.